For Hands: Apply EF-65 directly out of bottle onto hands. Rub together briskly for 30 seconds. Towel dry or rinse clean if desired. Clothing and Material: Wet clothing, apply EF-65 Auto Clean to stain full strength and rub material together briskly. Machine wash and dry. Carpet and Upholstery: Apply EF-65 full strength to spot with a damp terry cloth towel, rub back and forth in 5 to 6 inch motions until stain lifts. Wipe clean with a dry terry cloth towel. Always check for colorfastness. 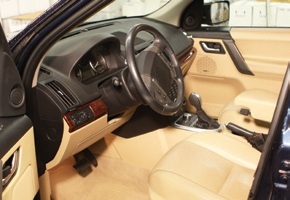 Remove dirt, grease, oil and food from car upholstery, leather and vinyl with EF-65 Auto Clean. Does EF-65 Hand Cleaner have any abrasives? No, it is gentle on your skin and won't dry it out with any harsh abrasives. You can use EF-65 all throughout the day without having to worry about drying out or cracking your skin, try it for yourself to see. Do you need water to use EF-65 Hand Cleaner? No, EF-65 Hand Cleaner can be used with or without water. Will EF-65 Hand Cleaner dry out my skin? No, there are no harsh chemicals, alcohols or abrasives to dry out your skin. The coconut based formula will not leave your skin feeling dry. Is EF-65 Hand Cleaner scented? No, EF-65 is fragrance free. Some customers say the smell reminds them of lotion, but there are no orange, citrus or overpowering scents added. What is the shelf life? There is no shelf life for our product, it will not go bad as long as the cap is securely on the bottle. If the bottle is left uncapped, the product may dry up over time. How long will one bottle last? The standard EF-65 Hand Cleaner bottle is 16 oz. and most people use about 1/4 to a 1/2 oz when they clean their hands. So in general, 1- 16 oz bottle will last about 60 uses. We also sell a 1 gallon size for industrial use that last much longer. The 1 gallon size also has an optional pump for easy and quick use. Is EF-65 Hand Cleaner Environmentally Safe? Yes, EF-65 is safe in both storm drain and sanitation systems. In fact, it is actually helpful in your sanitation system as it helps clean the system without harming the helpful bacteria. Tell us how you like EF-65! "My service manager used it after working on some suspension here and was very surprised by how well it worked and later told me it felt like he had been putting lotion on his hands since they felt soft afterwards." "I've had mechanics hands my entire life and have tried every product under the sun, I didn't know there was something that could clean my hands so well and not dry them out or leave them cracked. I am sharing my EF-65 Hand Cleaner with all my friends." "I bought EF-65 for my husband who is a metal fabricator. The hand cleaner he was using previously smelled so bad and always left his hands dried out. We are both so happy with the EF-65! Thanks"
"This is the best cleaner ever. I live in a house full of greasy boys that cant leave there hands off the walls. It doesn't take any scrubbing just wipe off. Works on anything. I love the results It's made my cleaning days easy and me much happier. You have to try it." "Ever since I have known him, my husband has struggled with eczema on his hands. As a mechanic, his hands are always coming into contact with chemicals that dry out his skin. He’s tried wearing gloves while working and moisturizing religiously, both of which didn’t work to clear up the eczema. The poor guy was always suffering with dry, itchy, broken skin on his hands. It wasn’t until he started using EF-65 Hand Cleaner that his eczema cleared up! He still works as a mechanic without using gloves, still handling the same harsh, drying chemicals. The only difference is him cleaning his hands with EF-65! It’s amazing to me that special (and expensive) eczema moisturizers failed to make a difference, but EF-65 cleared up the breakouts and kept them away almost immediately! I love it that my husband comes home with clean, moisturized hands." "EF-65 Hand Cleaner– AMAZING. Tried and tested. I heard the whole story from the guy behind the product, and it was quite compelling nonetheless (more to follow at a later date). In the meantime, to give you a brief overview, I did watch him scribble ink on a piece of velour, then use the product to remove the stain in a matter of seconds. (I almost felt like I was part of an infomercial.) Plus, it’s eco-friendly– buzz word in of the moment in every industry. Therefore it’s non-toxic, biodegradable, good for your skin, and won’t dry it out. Admit it guys, I know the latter may be more appealing up front to the ladies, but you don’t want dry hands either– and the “ladies” in your life sure don’t want your hands to be dry. Furthermore, I received a sample, so of course I tried it when I got home to really see the action (i.e. mysterious red stain on my carpet that wouldn’t come out for nothing). And guess what, it worked….carpet is now white again, and my hands are still soft. So yes, it’s also multi-functional. Made in the USA, it’s a gem in the garage, but fabulous for everything else too."